H.E. 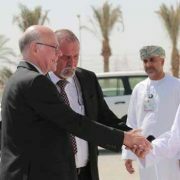 Prof. Norbert Lammert, President of the German Parliament, visited the German University of Technology in Oman (GUtech) on Wednesday 12 October, as part of his current official visit to the Sultanate of Oman. The President of the German Bundestag was accompanied by Honourable. Saleh Bin Mohammed Al Nazwani, Member of the State Council, H.E. Thomas Schneider German Ambassador to the Sultanate of Oman, Joachim Duster Chief Officer of the German Embassy in the Sultanate of Oman, as well as his personal secretary, Officers of the Bundestag Protocol Office and an interpreter. At the beginning of the meeting, Professor Dr. Michael Modigell, Rector of the University, in the presence of faculty, Dr. Hussein Al Salmi, Vice-Rector for Financial and Administrative Affairs, and Professor Dr. Armin Eberlein, Vice-Rector for Academic Affairs, delivered a speech welcoming the guests, Prof. Dr. Modigell presented a brief history of GUtech, the milestones, the increase in the number of students enrolled year after year, the rise in the number of programmes GUtech offers, and the scientific projects and researches it has carried out. H.E. Visited the new exhibition and conference centre at the University, which will host the Centre for the History of Science, which is considered one of the latest additions to GUtech facilities, scheduled for opening early next year. H.E. also met with members of the Student Council, to discuss their experience at GUtech and their views of current and future challenges. H.E The President of the German Parliament emphasized the importance of education and its relevance to modern and future changes and challenges, stressing that the main challenge students face now is to prove themselves, and to be able to compete in the labor market. H.E. 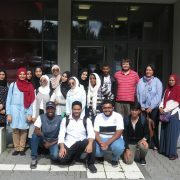 also discussed the importance of student exchange, which provides a good experience for students, to gain knowledge and exchange experiences with their peers in different countries, especially Germany.